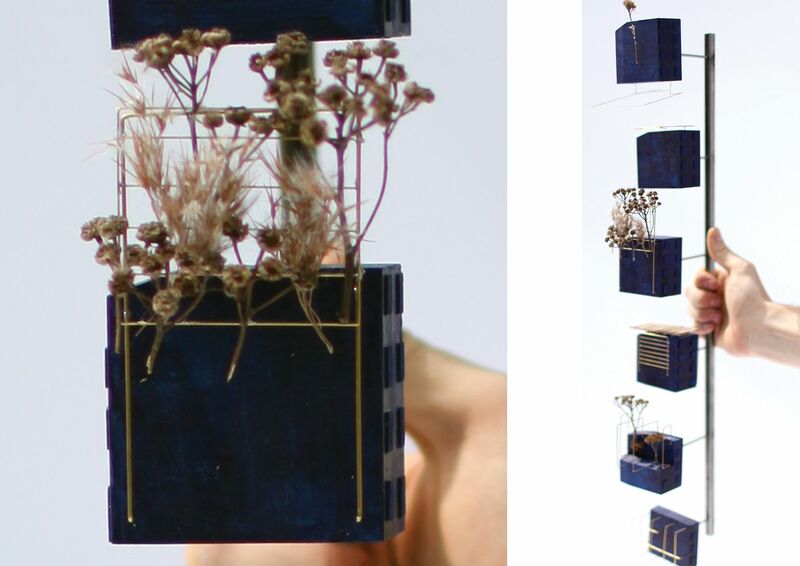 The follies are designed to suspend a living tree above the rooftops of the cities buildings. 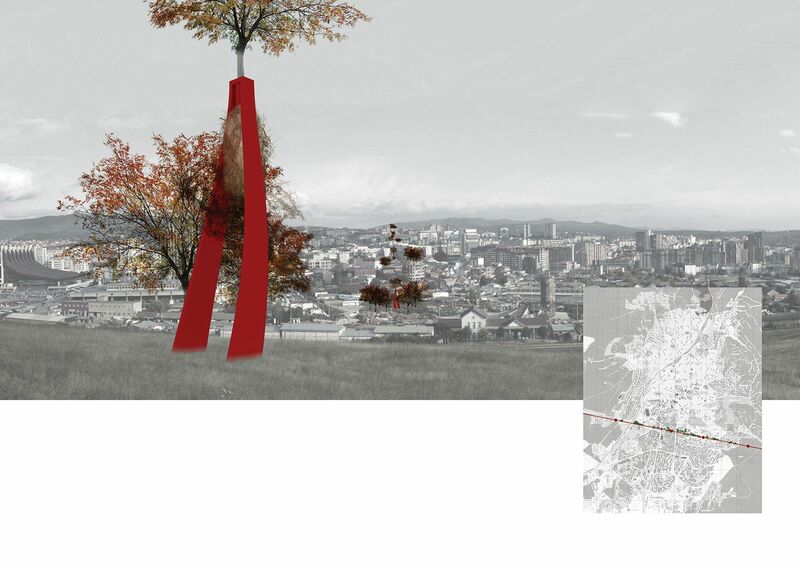 THE LINEAR MONUMENT seeks to develop a strategy to introduce radical new forms of constructed landscape and green space within PRISHTINA whilst remaining respectful to the existing urban condition. A theoretical line is proposed as a government intervention which is strategically placed within the district. 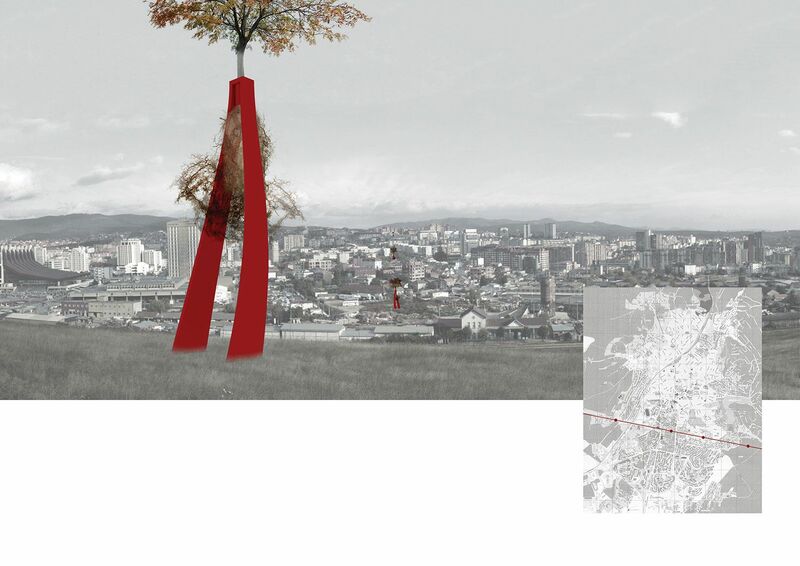 The line is given a commercial value, offering tax breaks and benefits for private stakeholders to develop green areas, landscape and greenery within 10 meters of the line. The project then speculates on the gradual reaction which the city has to this commercialised line and the potentials for a more radical green vein developing. The initial architectural development is kept to a minimum with a series of follies being proposed to mark the line. Private stakeholders are then encouraged to develop green areas over the course of 50 YEARS. 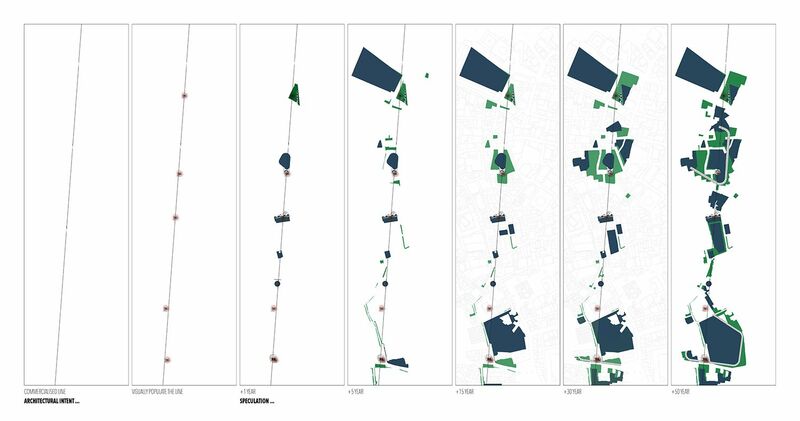 An understanding of a large scale temporal dimension is key to the projects success and it discusses ways in which radical transformations can be made to the city without being destructive to the urban character. New ideas for representing legislative change within a city are proposed which attempt to diverge from the architectural drawing or model and use the urban fabric as a representational medium. Subsequently the project attempts to bring discussions on large scale urban change into everyday city life and encourage local inhabitants to have more of a voice in large scale city redevelopment. 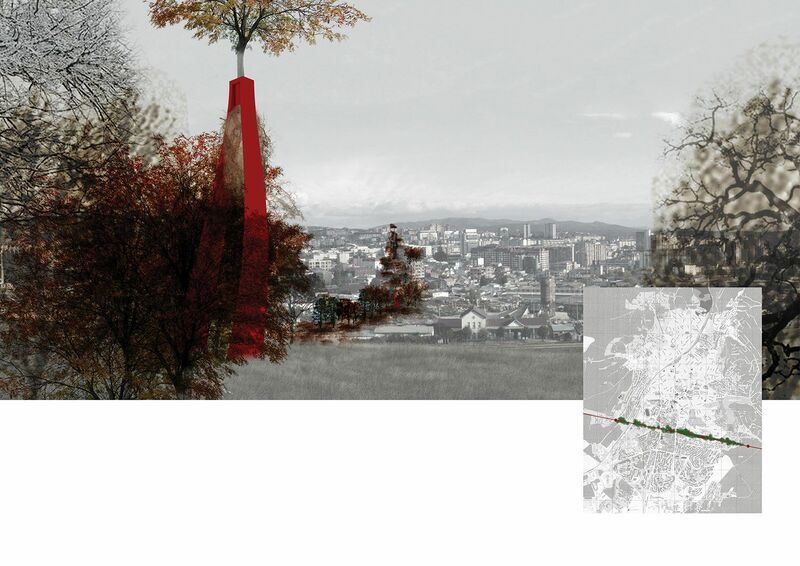 The notion of the folly and the LINEAR MONUMENT also brings forth ideas of a new major tourist attraction for the city. The final outcome, 50 years on, of the LINEAR MONUMENT is left open to cities private stakeholders and residents. What will the LINEAR MONUMENT appear as in the future ... ? 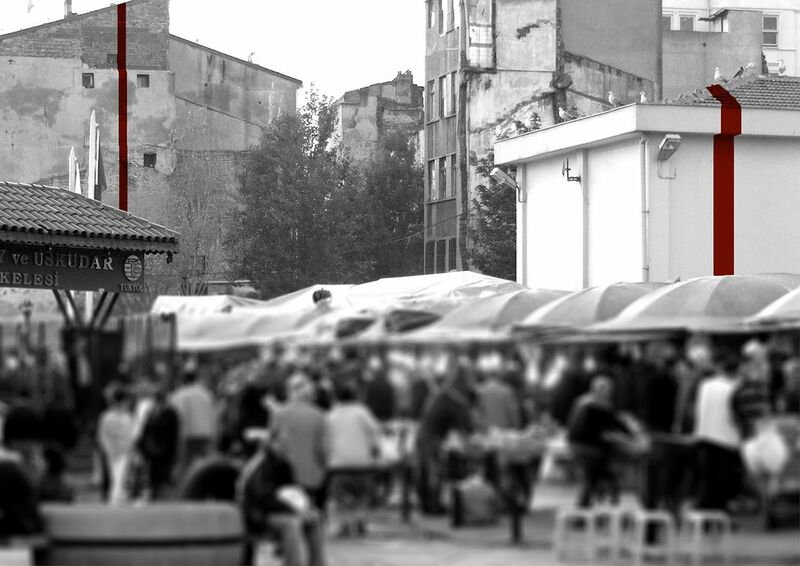 'Ideas for Prishtina: The Award for Urbanism' winning entry. 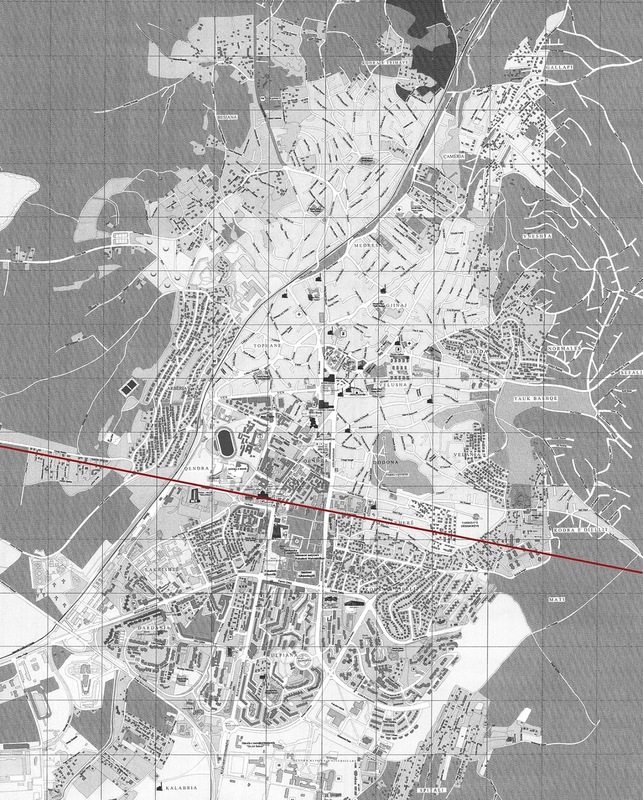 The theoretical line represents a commercialised vein which bisects the city from East to West, connecting the green hills on either side and crosses the university gardens. 1: Establish a theoretical line which is given a commercial value. 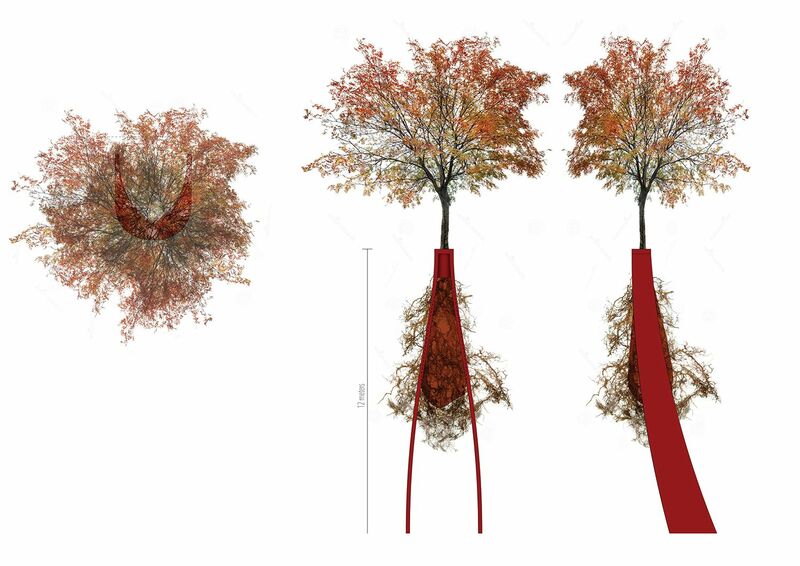 2: Populate the line with a series of red follies which elevate four trees above the cities rooftops. 3: Allow private stakeholders to respond to the commercialised line by receiving benefits for developing constructed landscape within its periphery. The LINEAR MONUMENT slowly forms itself over the course of 50 years. The follies are constructed from two angled steel plates which rise up from the ground and meet in the centre 12 metres from the ground. They hold a casing which grips the trunk of the tree, suspending it in the air. The roots of the tree are collected in a large Hessian sack, with some of them breaking through. A series of four initial sites are chosen for the follies which populate the line and cut through the city from East to West. The follies with the living tree on top sit just above the skyline of the average building making the line visible from certain vantage points. 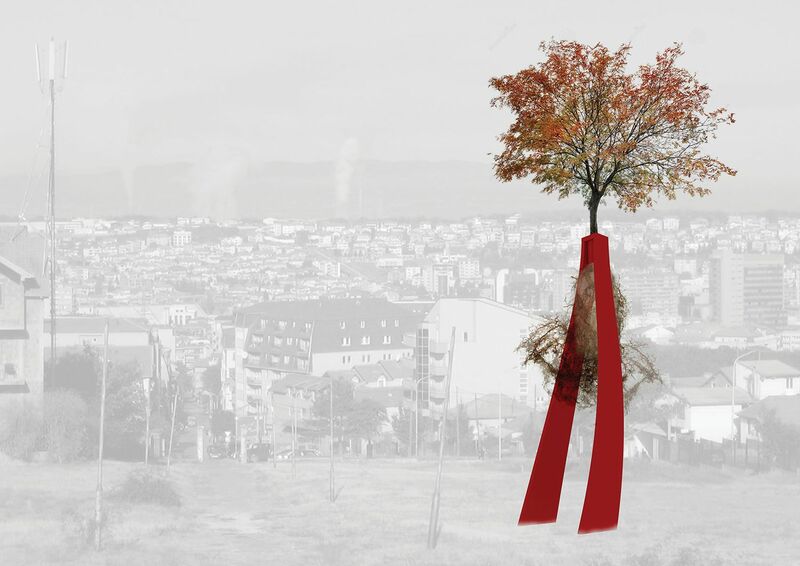 The follies aim to begin the discussion on green space within Prishtina and the potentials of the Linear Monument to a forefront within the city. Almost using the cities urban fabric as the architects drawing board. Local residents paint abstract markers on the side of two buildings which run along and mark the line, encouraging a discussion on the LINEAR MONUMENT and the addition of green space within the city. This model series explores various different changes made to an individual house in order to gain commercial benefits from the line. The model [top right] shows a very minimal change to the existing property, with a device designed in order to latch a tree to the side of the building. As the series develops the changes become more radical: roof terraces are added, then larger structures for accommodating greenery and finally the layout of the house is redesigned in order to maximise the amount of greenery on within the private boundary.